I have been biking and hiking with the kids every day this summer and I can really feel it at night as my muscles feel extremely sore. In order to feel my best so that I can relax and continue exercising with my family the next day, I have been using the Aromafloria Muscle Soak collection and it works beautifully. This wonderful bath and body collection features Muscle Soak Ocean Mineral Bath Salts, Bath & Body Massage Oil, Sugar Salt Glow Body Scrub and Foaming Body Bath. What I really like about this product line is that it is effective without any potentially harmful ingredients i.e. it is sulfate free, parabens free and phthalate free. I also appreciate the company’s commitment to no animal testing and products are 100% vegan! The Muscle Soak Ocean Mineral Bath Salt (SRP $23) is so relaxing. I draw a warm bath and add this product to the water. Unlike other bath salts brands that I have used in the past, Muscle Soak dissolves quickly into the water and I am soon surrounded by the most wonderful aroma. The scent of the aromatherapy essential oils is delightful with notes of Eucalyptus, Peppermint and Lemongrass (my favorite). As I soak in the bath I can feel my muscles relaxing and after about 20 minutes I am rejuvenated. For an extra luxurious and relaxing experience, I add a small amount of the Muscle Soak Foaming Bubble Bath (SRP $13) to the water too. It is designed to help soothe sprains and aching joints while gently cleansing the skin. I noticed that when I use this product my skin is soft as opposed to becoming drier. Therefore, I let my daughter who suffers from itchy, eczema prone skin soak in a bath using this product and she told me that it helped her skin “feel better”. It has a nice foaming bubble action that is pleasant and not overwhelming full of bubbles……a perfect home spa-like experience! My favorite product in this collection is the Aromafloria Muscle Soak Sugar Salt Glow Body Scrub (SRP $14). First, it smells amazing due to the essential oils which are refreshing and reinvigorating. The gentle yet effective scrubbing action was amazing and I used it on my entire body to get a nice glow. I love that it combines ocean mineral salts and organic sugar for excellent exfoliation. A small amount goes a long way so this product really is a great value too. To complete my home spa, I rub a small amount of the Bath & Body Massage Oil to my sore spots and it absorbs nicely into my skin. It is also nice to use on my legs to give it a pretty (and soothing) sheen when I am wearing a bathing suit or dress. I like that it isn’t greasy and it smells wonderful! Aromafloria has a wonderful selection of high quality skin and body care products including Inhalation Beads, Healing Waters, Men’s Care and much more. 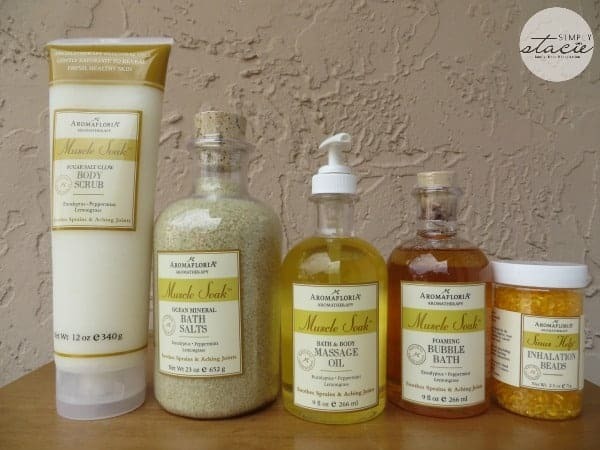 You are invited to visit Aromfloria to purchase the Muscle Soak Collection and browse the entire product line. salt glow body scrub is something I want to try. I would LOVE to try the Stress Less Ocean Minerals Bath Salts. I love taking a warm bath at night right before bed and these salts would be an excellent way to relax before bedtime! I really want to try all of these products honestly. I definitely need some relaxation. I’d like the Stress Less collection. The Muscle-soak-sugar-salt-glow-body-scrub.looks amazing to use love to try all their products. I need the Stress Less collection in my life! I would like to try the sinus inhalation beads. I’d love to try the Stress Less Inhalations beads. I would love to try the Sensory Fusion Foaming Body Wash with Shea Butter Pomegranate. Bath & Body Massage Oil. From the For Feet’s Sake, I’d like to try the Double Action Foot Scrub. The callous’s on the bottom of my feet are taking a hit from my summer foot wear. I like the Stress Less Calming Hand & Body Lotion. I would love to try the Sensory Fusion Pomegranate Salt Glow Scrub. I would love to try the Sensory Fusion Whipped Body Butter with Shea and Aloe Kiwi Coconut. When the weather changes, I have some dry spots that could use this for extra hydration! Already love the ‘Stress Less’ line! I’d like to try the Muscle Soak Ocean Mineral Bath Salts. I would love to try any of the products with Mango Ginger! I would love to try the Stress Less Collection. I would love to try the Muscle Soak Ocean Mineral Bath Salts. I would love to try the stress less collection! I love lavender — so I want to try the Stress Less Spa Rescue kit! The sinus help will be wonderful in the winter! I would like to try For Feets Sake Intense Repair Spa Foot Butter. trythe bath and body massage. try the bath and body massage.